In Texas salsa is a necessity all year long but we do change up the ingredients. Fall calls for rich, smoky flavors like those in this addictive sweet potato salsa recipe. 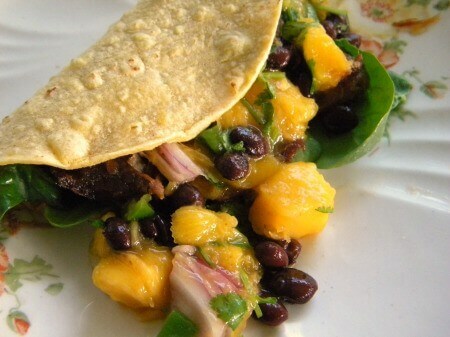 It’s fantastic on chicken or pork but just as good scooped up on a crunchy tortilla chip! This makes a generous quart of salsa. Keep it tightly covered in the refrigerator for up to a week. In summer I love light, fresh salsas like my honey dew salsa but come fall I want those rich warm flavors. I want it to have some weight and texture to it, too. This has plenty of texture but if you want even more cube some of the sweet potato instead of mashing all of it. You can use either sweet potatoes or yams just don’t use the canned kind. They are way too sweet and you won’t get the right flavor. Let the sweet potato salsa stand for at least 30 minutes after you get it together. It allows everything to blend together and deepens the flavor. We’re finally starting to get some autumn-esque weather here in Dallas. Although yesterday was nearly 90 degrees today it’s a bit cooler and rainy. I don’t live in Dallas proper – we’re about 20 minutes south of downtown in a small town surrounded by small towns. I was in the next town over (Waxahachie, for all you Texans) yesterday running some errands. And by running some errands I mean I was picking up some supplies for work. And by supplies for work I mean antiques. Anyway, a long train came through as I was waiting for it to pass so I could continue on my way I started thinking about our society. You could tell that people were antsy waiting for the train to pass. They were in a hurry to get to their various destinations. I was enjoying being out, away from my computer, and watching the train zip by. For me it was the first time in weeks that I didn’t feel like I had to be somewhere or doing something. It was a moment of timelessness I guess, a chance to take a deep breath and just be. I get up around 4:45 in the morning and my 16 year old son and I go to the gym. We’re back home by 6:15 where I get lunches packed and get the kids off to school. By 7:15 I am checking email and prioritizing my activities for the day. At around 12:30 I switch from the computer to the stove and work on recipes. Kids are home around 4:00 pm and I try to get finished up with my work by 5:00 or so. Then I get dinner on the table. After dinner I head upstairs to relax on the bed and watch TV with my husband but I have my computer open and am working on social media/editorial planning/ returning emails the entire time. Around 9 we’ll head out to the hot tub with a glass of wine. Since my beloved is a night owl we rarely go to sleep before midnight. Do the math. That’s roughly 19 hours of activity per day, 5 days a week. Is it any wonder that I find waiting for a train a pleasant respite from frenetic activity? I don’t think that I am the only person with that kind of schedule. In fact, I think most of us have that kind of craziness going on in our lives. Staying in the moment, taking time for yourself, stopping to smell the roses … all of those sound great but exactly how do I fit them in? I mean, I have to write bathroom breaks into my schedule! We have just a few weeks left in 2015 but it’s enough time to create a habit of slowing down. I’m going to gift myself with 15 minutes a day of unscheduled time. Maybe in a few weeks I can wrestle my schedule for a full 30 minutes but for right now I know I can do 15. How about you? What’s your schedule like? Is it time to back off a little? Chipotle in adobo goes a long way because it has so much flavor. You’ll probably only use one pepper at a time but you can mash them all up and freeze them in ice cube trays. Thats just about the perfect size for most recipes. And,Gift from the Sea by Ann Morrow Lindbergh is one of my favorite books. I first read it in the early 1980s an it’s message to me was crystal clear; simplicity, graciousness, simple solitude. It’s beautifully written and I highly recommend it if any of my words above resonated with you. Here’s that yummy sweet potato salsa recipe! Rich, golden sweet potato pulls this salsa into autumn. It's rich and smoky with plenty of heat. It's a great dip for chips, a sauce for chicken, or on a taco. Give it a try! Slit the sweet potatoes and bake or microwave until soft. Cut the sweet potatoes and scoop out the flesh. Mash well or process in a food processor until smooth. Measure out 2 cups and set aside. Mash 1 of the chipotle peppers until it is a paste. Heat the olive oil in a heavy saute pan. Add the tomatoes, onions, and garlic. Saute until the onions are soft and translucent. Stir in the RoTel tomatoes (don’t drain), the 2 cups of sweet potato, mashed chipotle, lime juice, cinnamon, cumin, cloves, brown sugar, nutmeg, salt, and ginger. Allow to cool to room temperature and stir in the cilantro. Let sit for 30 minutes before using for the flavors to blend. If you like more texture in your salsa cube 1 cup of the cooked sweet potatoes and mash 1 cup. Hi! Thank you for sharing. I am a salsa making newbee but have been trying to make iy in bulk since I only have 1 full day every 2 months for a big food prep Do you think this recipe would be able to be canned or adjusted to be canned? Thank you so much! There’s not enough acid in this to can it safely and no real way to make it acidic enough – sorry. Great idea to use sweet potatoes here and yes my plate runneth over as well! It’s so good! Definitely a unique combination!